"The Trolley Parks of Maine takes you on a guided tour of thirteen of the numerous trolley parks that were operated by electric railways throughout Maine at the turn of the last century. Illustrated with numerous photographs and hand-drawn maps." 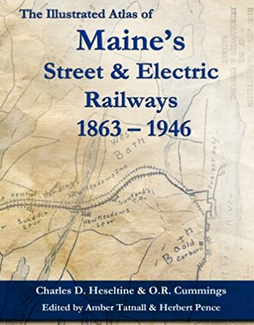 "The Illustrated Atlas of Maine’s Street & Electric Railways covers the early roots of public transit in the state of Maine, including the early horse railroads, electric street railways, and electric interurban lines. The maps were hand-drawn by Charles D. Heseltine and the plates were annotated by O.R. Cummings. Both Heseltine and Cummings are notable authors on street and electric railways. 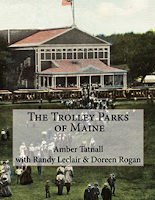 The maps are accompanied by more than 160 images of photographs and postcards from Cummings' research collection, now housed at the Seashore Trolley Museum Library in Kennebunkport, Maine."